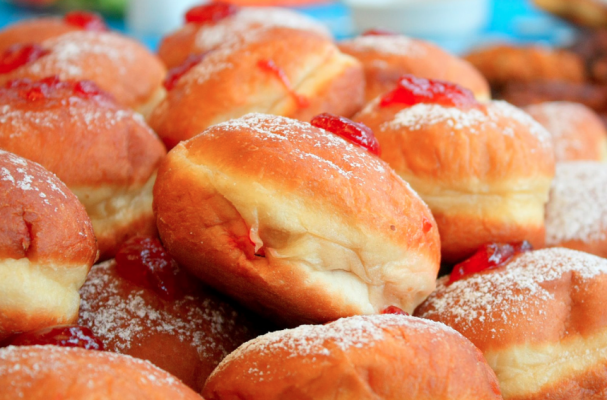 Freshly fried and piping hot, sufganiyot, is hands down one of Hanukkah's greatest pleasures. These Israeli jelly doughnuts are a symbol of the oil burning lamps that miraculously lasted for 8 days in the ancient Holy Temple in Jerusalem. This traditional Hanukkah treat is consumed by the dozen, especially when they are homemade and straight from the fryer. If you have ever made doughnuts at home before, you know that it can be quite a lengthy process. That is not to say that it is necessarily difficult but since doughnuts are made from a yeast dough, it needs time to rise and rest before it can be thrown into the fryer. I like to add a sprinkling of freshly grated nutmeg when mixing the dough because it adds a subtle spice and makes these doughnuts feel a little more holiday-ish. These incredibly light and airy doughnuts are filled with fruit preserves and dusted with an exorbitant amount of powdered sugar. Seedless raspberry jam or strawberry jam are household favorite fillings as their slightly tart flavor compliments the richness of the doughnut but any flavor (presumably your favorite) will do. Check out one of our favorite sufganiyot recipes here and watch the technique down below.